Freshman quarterback Wahid Nabi drops back to pass to an open receiver during the Bombers' game against Hobart College. The Blue and Gold defeated the Statesmen 24–21 at Butterfield Stadium. 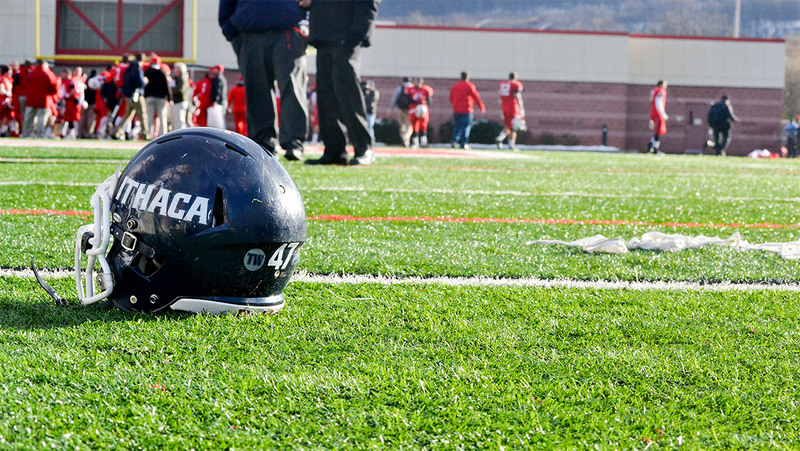 The Ithaca College football team defeated Hobart College 24–21 Sept. 30 at Butterfield Stadium. The Bombers secured the win with just 42 seconds remaining in the game when senior running back Tristan Brown found the end zone from two yards out. After the Bombers failed to convert on fourth down, the Statesmen took over on downs with two minutes and 12 seconds left in the fourth quarter, leading 21–17. The Bombers forced a three-and-out in 26 seconds and regained possession on the Hobart 46-yard line with one minute and 46 seconds to play. After moving the ball to the 16 yard line with 52 seconds left, freshman quarterback Wahid Nabi connected with senior wide receiver Jared Bauer on third down for a 14-yard gain. The Bombers went no-huddle on first down, and Brown fought his way into the end zone for a two-yard touchdown to give the Bombers the lead. Head coach Dan Swanstrom said he was impressed with his players’ ability to stay calm and fight through the adversity of such a tightly contested game. The touchdown with 42 seconds to go was Brown’s second of the day as he led the Bombers’ ground game with 120 yards on 23 carries and two touchdowns, both of which came in the fourth quarter. After averaging 88 rushing yards per game through the first three games, Swanstrom said he was happy to have a balanced offensive attack in this game. While Brown did most of the scoring, Nabi led the offense, completing 29 of 45 passes for 343 yards and one touchdown. He has now thrown for over 300 yards in both of the first two starts of his career. Sophomore wide receiver Will Gladney said Nabi’s toughness is a large part of his success. Swanstrom said his freshman quarterback played well but has plenty of room to grow. “We have high expectations for him and honestly I’d rate his performance today as a six out of 10,” Swanstrom said. Gladney was a large part of Nabi’s success against the Statesmen, as he brought in 12 of Nabi’s 29 completions for 183 yards and one touchdown. Nabi said playing with receivers like Gladney and senior wide receiver JR Zazzara make his job as quarterback much easier. “Having a security blanket like that is amazing because I can just throw it up and have confidence that it’s going to be caught,” Nabi said. Swanstrom said Gladney can play much better than he did in this game. This win puts the Bombers steadily atop the Liberty League Conference, as they are now 2–2 on the season and 2–0 in the conference. Brown said this win shows how good the Bombers can be. The Bombers will hit the road for Rochester, New York for their next matchup at 12 p.m. Oct. 7 against the University of Rochester.